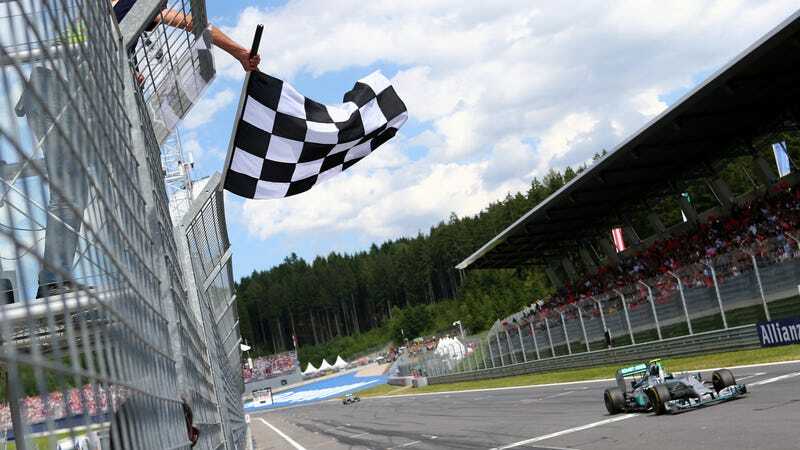 Nico Rosberg winning the Austrian Grand Prix in 2014. After an officiating miscommunication led to this year’s Formula One Canadian Grand Prix ending a full two laps early, F1 announced Friday that it won’t rely on us humans to end races anymore. A computer will get the responsibility instead, and digital checkered flags will be the new norm. The light panel at the start-finish line will become the new checkered flag, showing checkered lights to signal the end of the race. That doesn’t mean the traditional checkered flag will go away, especially since the light panel isn’t in the view of everyone on the start-finish stretch, but it’ll just be for show. If the checkered lights aren’t on, the race isn’t over. F1 didn’t say whether the digital checkered flag will be completely computerized or just run by a traveling F1 official, but the idea of a digital checkered flag next season came up earlier this year after a big blunder at the Canadian Grand Prix ended the race on lap 68 instead of lap 70. The guest waving the flag, model Winnie Harlow, got a lot of the blame and blowback for it, but Autosport quoted F1 race director Charlie Whiting as saying said it wasn’t her fault at all—it was a miscommunication with local officials, and she was just following directions. Whiting said after the race he figured the miscommunication stemmed from the way F1 counts laps, and that a local official who’s not around F1 all the time got confused when they saw a graphic showing lap 69 of 70, thinking it showed laps completed instead of the lap drivers were on. The latter was the case, meaning drivers should have raced a whole lap with the board saying “70 of 70.” Whiting said that’s no big deal for F1’s traveling crew, but that the series needed to do a better job of briefing local, temporary hires on the way its system works. F1 stewards decided after the early wave to treat the checkered flag like a red one, thus ending the race after 68 laps instead of 69. The early ending didn’t matter much for the winner by an entire zip code, Sebastian Vettel, but a few other drivers could’ve used lap 70 to catch people in front of them. Autosport quoted Whiting as saying a few days after the race in June that F1 was considering going to a digital flag and an automated system to signal it, and four months later, the digital flag is official. Starting next year, the waving of the checkered flag will be no more than a ghost of what it is now, symbolic but meaningless as we slowly turn this world over to the computers. But, you know, computers are probably better at this “communication” and “counting” stuff than we are anyway.